My name is Seth Ellenwood and I’m the art director at Abante Marketing. I’ve been here since 2014 and working in the industry since 2012. A little bit about myself and why I’m here … I started by getting a two year degree in visual publications at a community college. Honestly, I didn’t learn much there other than using the Adobe Creative Suite and I’m glad I didn’t waste much more time and money pursuing more school. From my experience, you obtain the real skills when you go to work. I possess a passion for graphic design and in the last year I have narrowed my focus towards illustration. It’s not unusual for me to get home from Abante and work on my personal illustrations for another couple of hours. If you love it, you love it, and keep doing it, and keep improving. My style is highly “cartoony” and I love using bright, saturated colors. 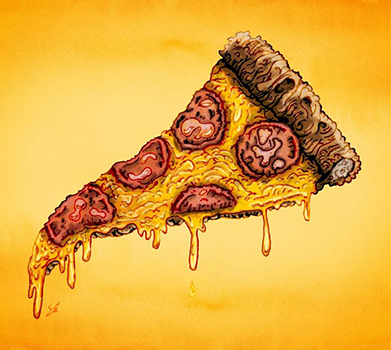 My favorite subjects to illustrate are junk foods (although I try my hardest to avoid them in real life), particularly, I draw the junk food to have human characteristics such as faces and limbs. Also, I have the most lovely and talented wife, the most precious daughter, awesome dog, chunky cat, cool looking fish, and poorly tuned drum kit. But enough about me, let’s get started. Since I’m kicking off the first blog entry in the art department, we’re going to start with the basics (the meat and potatoes). This isn’t super exciting stuff here folks, but it’s very important to know even if you aren’t a graphic designer yourself. 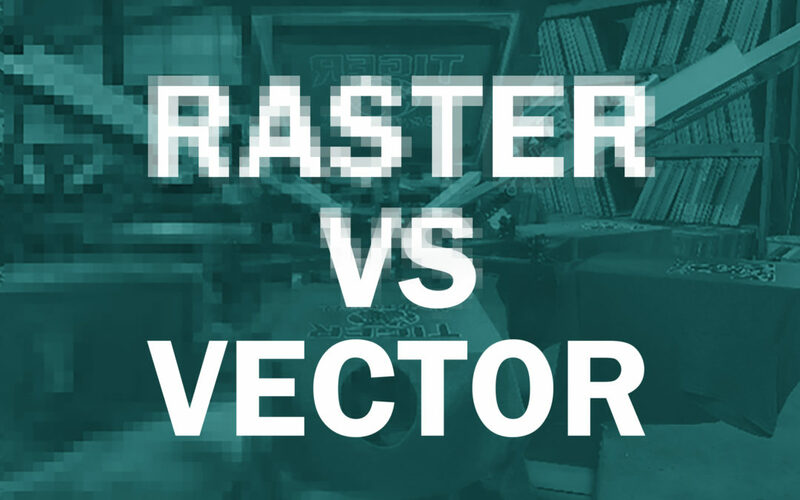 As graphic designers, one of the first things we are taught is the difference between raster art and vector art. I can’t emphasize enough how important it is to know the differences if you are dealing with your organization’s art in any capacity. Raster images are made of a bunch of individual pixels or dots. 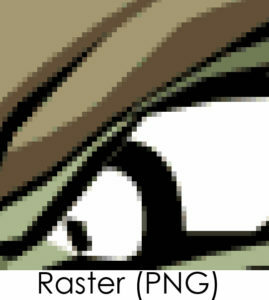 You can easily identify a raster image by zooming way into it and the pixels will become visible. Raster images are preferred when working with any photograph. When photos are taken with a digital camera or scanner, those devices create a raster image. The number of pixels that make up the image determine its resolution. Because raster images only contain a certain number of pixels they can’t easily be scaled up. Once an image is at a certain dimension, you may not be able to use this image at a larger size without losing quality. If an image is said to be low resolution, it can look jagged (this is not desirable). Basic file types for raster images are .jpg, .gif, .png, and .tif. In the art department, if we need to manipulate a raster image in any way, our Adobe program of choice would be Photoshop, which creates .psd files. Vector images are made of mathematically calculated lines and curves called paths. Vector art must be created with computer programs that deal with these mathematical curves using nodes and handles to plot the paths of these curves. Because vector art is created this way, it can be scaled limitlessly without losing any quality or becoming pixelated. The art will be the same quality if you printed it on a small business card or a large billboard. 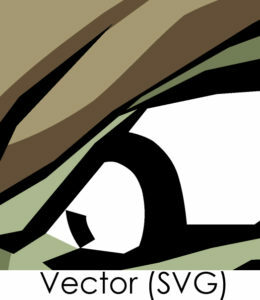 A vector image’s edge will always look smooth no matter how close you zoom into it. A vector image is typically saved as a native file from the program used to create it. The program we use is Adobe Illustrator, which creates .ai files. There are also universal file types such as .eps or .svg. Vector art is best for logos and illustrations. 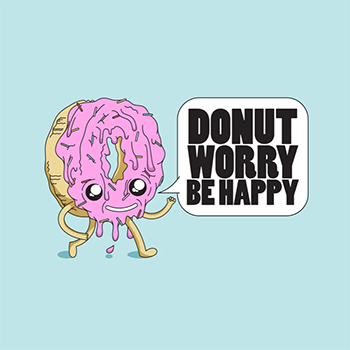 A vector image is the top choice when designing, creating, or submitting a logo. Because of the way it’s saved, you will have the most flexibility in making changes to the color or re-sizing it. This also saves a lot of time on our end. For example, if you give us a raster logo to be printed on a t-shirt, we will likely end up re-drawing it to be vector art. We always do our best to match the original, but sometimes we need to take creative liberties such as choosing a different font for that tagline and this might not be ideal for you. Avoiding this extra work by submitting a vector logo will also help you avoid potential art charges. However, raster images do have their place if your artwork needs to look very photo realistic or if it requires a lot of color blends with shadows and highlights. That being said, you will want to avoid raster images when creating and working with logos. So there you have it, the meat and potatoes. Eventually we’ll get to the steamed carrots and dinner rolls, and then eventually the seasoning (so many food puns). What this means is eventually we’ll take you through the process of some of the art we do. Keep an eye out for more blog submissions from me or our other artists. We’ll continue to shed a light as to what exactly goes on in the art department or anything else new or exciting we care to share with you.